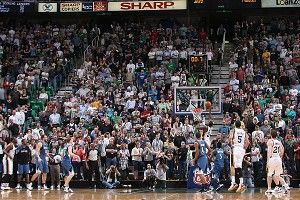 With the game tied at 99 in the fourth quarter, the Utah Jazz had the ball with 0.7 seconds left to pull off a game-winner against the Minnesota Timberwolves on Thursday. Minnesota stayed in their man-to-man defense on the final possession, so the Jazz came up with a play involving several looks to distract the Timberwolves while setting up their main action — a lob to Paul Millsap. 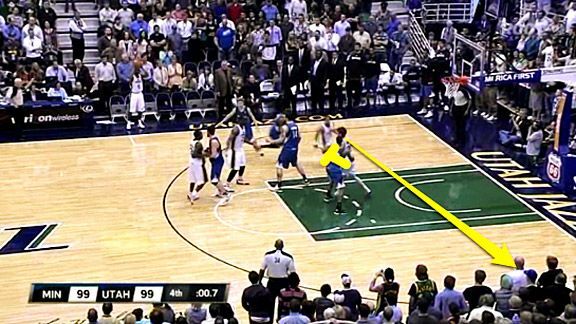 Before the inbounds pass, the Utah Jazz line up at the free throw line, with Al Jefferson in front, then Millsap, Gordon Hayward, and Devin Harris, in that order. When the referee gives the ball to Jamaal Tinsley, the inbounds passer, who Minnesota leaves unguarded, Harris curls over the top of the line and cuts in front of Tinsley. 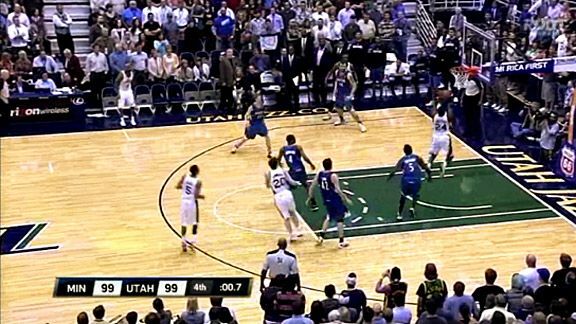 As Harris starts his cut toward Tinsley’s defender, Hayward cuts to the front of the rim. 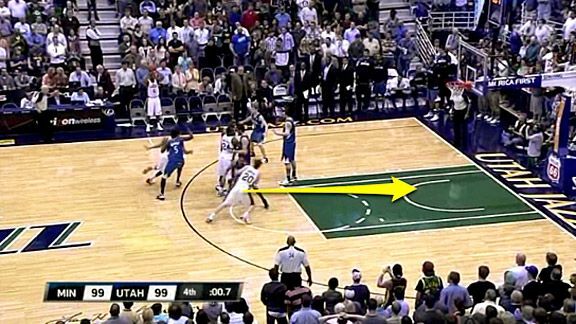 The hard cut is designed to make the Timberwolves think that a lob is going right to him. Hayward, however, stops in the middle of the lane and sets a quick screen for Harris, who continues his curl through the paint and moves to the opposite wing. 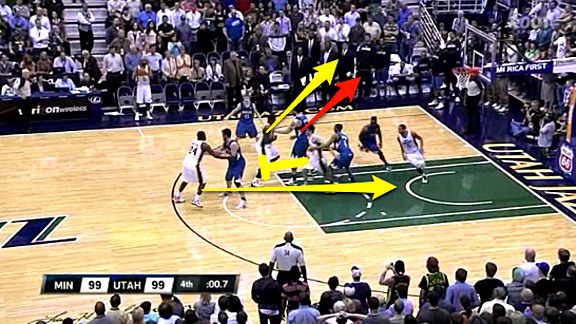 As Harris continues to make his way to the opposite wing, Jefferson quickly flashes to the corner on the ball side. The movement catches Nikola Pekovic off-guard and causes him to follow Jefferson even though with 0.7 seconds remaining, the big man is not a threat to score from that distance. 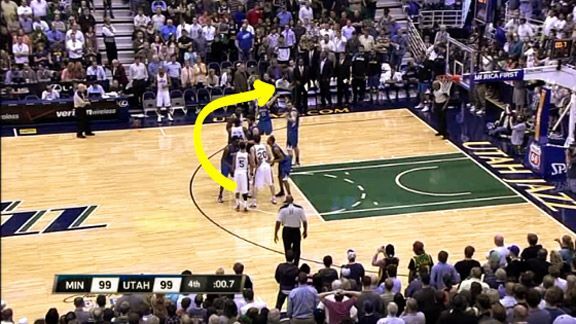 Meanwhile, Hayward goes from setting a cross screen for Harris to setting a back screen for Millsap. Millsap sets up the screen and uses it to get to the front of the rim. Pekovic has abandoned the paint to deny Jefferson, who has one career 3-pointer, in the corner. This allows Hayward to set a strong screen on Kevin Love and prevent him from trailing Millsap. Martell Webster, Harris’s defender, notices that Millsap is moving unimpeded to the rim, but he recognizes the play too late. The problem is compounded by Luke Ridnour, who has not moved from his initial position, despite there being no offensive players in his area. 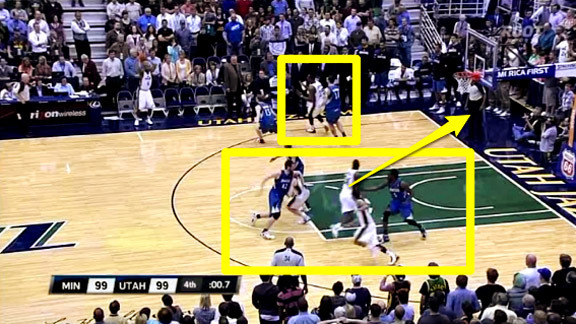 The result is a wide-open layup, and even though Millsap misses it, it’s definitely not because of defensive pressure. On a play where they can only really get beat by a lob at the rim, the Timberwolves have their center in the far corner and their power forward at the elbow, and Ridnour still hasn’t moved. All five players made defensive mistakes here, but the biggest mistake was made by Rick Adelman, who put his defense in man-to-man instead of zone with less than one second left. This is one of my biggest pet peeves. With less than one second left, a lob at the rim is a much bigger threat than a catch-and-heave from behind the 3-point line. Last year, it felt like there was an unusually high number of last-second lobs that won or tied games. Each time a lob was successful, it was against a team playing man-to-man with less than one second left. In this situation, there is no reason a team not to play zone and keep the center in to defend the rim. While playing zone, each defender is tracking the ball and facing the entire offense. With the inbounds passer not a threat, the defense has five players guarding four. The problem is that most teams use that extra guy like the Timberwolves used Ridnour. Not only are the Grizzlies in man-to-man, but they have their biggest defender, Marc Gasol, attempting to bother the inbounds passer about 50 feet away from the rim. It’s no surprise they get burnt by a well-executed play. The Mavericks try to run a play involving a back screen for Shawn Marion, but because the Grizzlies are in zone with a 7-footer standing in the paint (the Grizzlies get real creative here, using Marc Gasol to bother the pass and their back-up center Hamed Haddadi in the zone protecting the rim), there is no chance of that lob working, and Jason Terry is forced to heave up something from near half court. If teams keep finding success in the final second with lobs to the rim, we might see more teams playing zone to defend it — but probably not.